Did you know that when cooked, the Best Bird Food Ever! (BBFE) Complete Protein Sprouting Blends make the perfect mash for your birds? I’ve been feeding this in place of pellets since 2013. In response to the numerous emails we’ve received asking how to make a mash, here’s how I make it in northern Nevada. Please do not add vegetables or other ingredients to this Mash Recipe.The purpose of feeding your birds this cooked mash is to ensure they are receiving their required daily amount of complete protein. Use our BBFE mash in place of pellets, or other soft cooked foods your bird may enjoy (such as cereals, noodles, cooked grains, cooked beans, baby food, etc). Two cups of our dry (un-sprouted) BBFE Sprouting Blend, after preparation, makes between 7 and 8 cups of mash. You’ll never see a pellet do that. 1. Learning to make our mash, is similar to learning to grow our sprouting blends. The process you use may vary slightly from this recipe depending upon the altitude and climate where you live. 2. When learning to make this mash rinse the sprouting blend several times, like you would before sprouting it. This removes any dirt or dust that may be present. 3. Then you’ll need to soak the BBFE, before cooking. Be sure to use the same good quality water you use when sprouting. The BBFE will absorb the soaking water and will more than double in size. Because of this make sure you have plenty of water in the pot, with enough water above the BBFE. Let this soak overnight, or for about 12 hours. I use 4 to 5 cups of good quality water to soak each 1 cup of our dry (un-sprouted) BBFE. When I soak 2 cups of our dry BBFE, in 10 cups of water, it increases to about 5 cups. After cooking, this will make between 7 and 8 cups of cooked mash. 4. After the 12 hour soak, drain the soaked BBFE, throw out the soaking water and rinse the sprouting blend repeatedly until the water coming off of the ingredients runs clear. 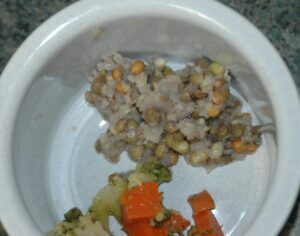 BBFE cooked as a mash, feed in place of pellets. 5. Now to make the ‘Ideal Cooked Mash’ for your birds you’re ready to cook the BBFE. You can use either a pot on the stove or a crock pot set on low. Put the soaked and rinsed BBFE into a pot and add water. Because the ingredients will absorb more water during the cooking process you’ll need to add four to five times the amount of water when compared to the amount of ingredients. When I make this for my parrots I have soaked 2 cups of the BBFE overnight, after soaking it has swollen to about 5 cups. After rinsing the soaked BBFE, I put it into a pot and I add 7 cups of water for stovetop cooking at a low heat. Cooking water: 7 cups gives you a cooked mash where the ingredients easily separate from each other when feeding it.My parrots prefer this texture. Using 8 cups of water for cooking gives you a soupier mash. This recipe makes between 7 and 8 cups of cooked mash, depending upon the amount of water used when cooking. 6. On a stovetop bring the mash to a slow boil and lower the heat so that it’s cooking at a low boil. You’ll want to cook the ingredients until they are soft. Here in northern Nevada, at an elevation of about 5,200 feet, it takes about an hour of stovetop cooking, on a low heat with the pot uncovered, for this mash to reach the soft and mash-able consistency my birds enjoy. Just as climate effects how you sprout, the elevation where you live will effect how long you’ll need to cook our sprouting blend mash for it to reach the desired softness. You may need to add more water during cooking, or use less water, depending upon where you live and the final consistency you want for your birds. 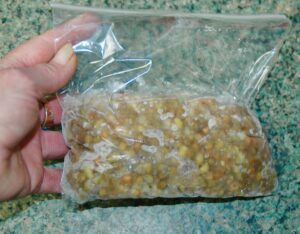 BBFE mash in plastic bag for freezing. 7. 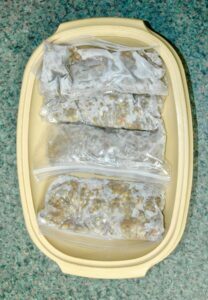 Because I’ve cooked a timer-saver amount of mash I leave some in the refrigerator, for use over the next 3 to 4 days, and freeze the rest. I use BPA-free sandwich-size plastic baggies, I found these at Smith’s Grocery. In each baggie I put enough mash for two to three daily servings. For me this mash will keep for about 3 to 4 days in the refrigerator after being cooked or thawed. Then, whenever you want to feed the ‘Ideal Cooked Mash’ just thaw a baggie. I set one out in a bowl overnight at room temperature. You can feed it as is, or warm it gently on the stove top. I advise against using the microwave when warming and cooking foods for your birds. BBFE Mash, a frozen supply. CAUTION: If warming the mash, be sure it has cooled down to room temperature before serving. Birds lack the ability to feel or sense heat in their beak and mouth. If you feed food that is too hot, you can burn the soft tissues in their beak, mouth and crop. This creates a serious medical emergency that requires immediate veterinary attention. 8. Although your birds will receive the most nutrients from our BBFE Complete Protein Sprouting Blends when they are grown into sprouts, please use this mash recipe as a substitute for pellets and other soft foods your birds enjoy. We’d love to hear about your experiences when preparing and feeding this mash to your birds. If you have any questions or suggestions please send us an email at info@moranscritterconnection.com . Leslie is skilled at using food and nutrition to reverse or prevent disease conditions from developing in the first place in parrots and finches. Since 2002 she has been researching the facts and translating the science of nutrition into practical solutions, and easy to use food combinations, for those who care about the health and well-being of the companion birds, parrots and finches, in their homes or their aviary flocks. I landed in your website while looking for healthy food recipes for my quaker parrot. Thank you so much for such an informative website! I am totally against pellets especially since I discovered they contain sugar, oils and colors that are bad for birds. I am trying to ween my quaker parrot from pellets to natural food. He’s 7 months old. Can I feed him with sprouts ? Our sprouts would be great for your little Quaker. 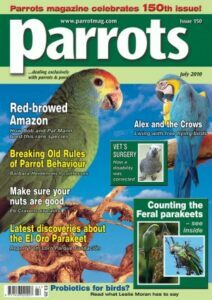 Take a look on the Home Page on our website and down load a copy of my free report: “Why Parrots Need balanced Nutrition”, I think you may like the info it contains.